Peter Goossens, the patron-cuisinier at Hof van Cleve in Kruishoutem, is often referred to as one of the godfathers of modern Belgian cuisine and he is one of Belgium's most respected chefs. After his education at a Belgian catering college Peter Goossens spent several years in France were he trained in e.g. the Paris kitchens of Le Pré Catalan and Robuchon. When he returned to Belgium he started working at IJzerberghoeve in Kruishoutem and few years later, in 1987, he bought Hof Van Cleve. One of the conditions in the sale and purchase agreement was that Peter Goossens would not be allowed to serve 'gastronomic' food at Hof van Cleve for 5 years after the transaction. So until 1992 Peter Goossens served his guests straightforward Flemish food. But when he started with haute cuisine in 1992 he was awarded his first Michelin star only two years later. A second star followed in 1998 and in 2005 the restaurant was awarded the ultimate accolade which it has retained ever since. At the time Hof van Cleve was the third three-star restaurant in Belgium, together with De Karmeliet in Bruges and Comme Chez Soi in Brussels. Currently Belgium still has three three-star restaurants, the other two being De Karmeliet and Hertog Jan in (near) Bruges. Hof van Cleve is also well-known for its number 15 ranking in the World's 50 and its the only Belgium restaurant to feature in the list. Hof van Cleve is located in a beautiful old farmhouse in the countryside between Kortrijk and Ghent. The restaurant is open for lunch and dinner Wednesday till Saturday. You can choose between a 5-course (€195) or 7-course (€230) 'Freshness of Nature' menu, a daily changing 'Market Walk' menu, a vegetarian menu called "Pure Nature" (7 courses, €150) and the a la carte menu. I had lunch there on Saturday 17 December 2011 and I had the 5-course Freshness of Nature menu. First the pre-starters, 5 in total. The first one was an aubergine bonbon wrapped in lomo served with a sesame crisp. The second and third pre-starters were served on one small plate: a green herb omelet and a miniature oxtail croquette served with some mustard. Three lovely and tasty pre-starters. Next up was Jerusalem artichoke creme, beetroot, black truffel creme, served ice-cold, light and refreshing (no photograph). The fifth and last pre-starter was squid two ways. The marinated squid (in the small bowl) was light and creamy and was served with a fantastic squid cracker. In the cup was delicious soft squid served with coco beans, chorizo and aioli - nice texture from the beans and lovely warmth from the chorizo. The first course of the menu was Razor clam, wood sorrel, North Sea shrimps and fennel. This dish was served in three courses. First up were the North Sea shrimps served four ways, brown shrimps on algae toast, brown shrimps lacquered with curry, scampi maki and a prawn cracker served with a sweet and sour dipping sauce, avocado and lime. The brown shrimps on the algae toast were fresh and light, wonderful elegant salty notes from the algae. The lacquered shrimps were lovely and comforting. Loved the scampi maki, wonderfully fresh and pure. The dipping sauce that came with the prawn cracker had a perfect sweet and sour balance. On the second plate was a razor clam, wood sorrel ice cream, brown shrimps, langoustine. A dish with straightforward and pure flavours but there was so much going on, that it was difficult to pin down. Last plate was Cockle, mussel, fennel, brown shrimps served with a Bouillabaisse sauce. Well-cooked cockle and mussel and absolutely fantastic Bouillabaisse sauce and a perfect touch of fennel. Three wonderful plates of food, all beautifully presented. Second course, Scallops served two ways, cold and warm. First the cold dish: sliced scallop, Dashi ice cream, Hijiki (marinated seaweed), smoked eel, oyster tartare, radish, cucumber, salmon caviar, purslane. The sliced scallop was lovely and fresh. Wonderful smokiness and warmth from the eel. Lovely bite from the cucumber and radish and nice saltiness from the salmon roe. Well-judged use of the Hijiki and dashi resulting in very elegant Japanese flavours. A complex dish with a lot of elements but they worked incredibly well and the scallop managed to remain the star of the dish. The warm dish was grilled scallop served with Dashi sauce/stock, smoked eel, potato, chanterelles and celeriac. Perfectly cooked juicy scallop accompanied by a gorgeous Dashi sauce. The sauce and the smoked eel provided an excellent warmth and richness to the dish. Both dishes were creative and well-balanced. Before our main course we were served a lovely and tasty hare paté with a perfect beetroot crisp. Our main (and third) course was Fillet of hare, hare stew made from the shoulder and the back legs, hare liver, salsify, Brussels sprouts, parsnip, parsley root, sauce Poivrade, apple, potato. Terrific succulent hare fillet and the stew was gorgeous and peppery, both had the most wonderful intense hare flavour. Well-reduced rich and sticky sauce. Wonderful touch of tartness from the apple. Excellent use of vegetables, especially liked the delicate parsnip creme and the buttery potato mash ball that was covered with a hazelnut and cardamom crumb. A rich and exciting main course. On to the desserts. The pre-dessert was Caramel, mocha ice cream and chocolate mousse. Lovely rich flavours but refreshing at the same time (no photograph). The fourth course and first dessert was Kumquat, pineapple, liquorice, chocolate (Sao Thomé 70%), yoghurt ice cream, vanilla oil, white chocolate crumbs. A beautiful dessert with lovely bitters from the kumquat and fantastic intense chocolate flavours. Lovely texture from the white chocolate crumbs. An excellent dessert with very elegant and clean flavours. Great to be served a chocolate dessert that isn't just sweet and rich. Last and fifth course Jonagold apple (caramelised and marinated), 'vlaaien' creme, Granny Smith and vanilla sorbet, Kalamanchi jelly. A wonderful light and elegant dessert with divine apple flavours. The 'vlaaien' creme, which had an intense apple and raisin flavour with a hint of alcohol, provided a wonderful richness to the dish. Fantastic Granny Smith and vanilla sorbet, very well-balanced. A brilliantly executed dessert with the perfect sweet and sour balance and fantastic textures. I first visited Hof van Cleve in 2006, this was my second visit. 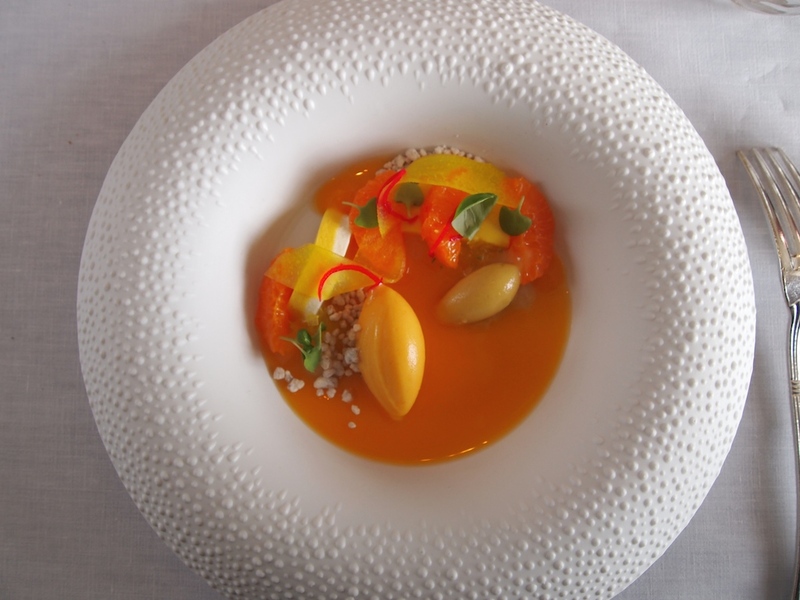 Peter Goossens is a very experienced three-star chef and that shows on the plate. With this menu I believe I got a good insight into his extensive repertoire of masterfully crafted dishes. Here's a chef who delivers technically strong and very complex dishes with sometimes large numbers of ingredients. Although Peter Goossens has been a champion of local and seasonal food for many years, he does not shirk from using exotic or even outlandish ingredients but always provided that they are functional and work together perfectly. This is modern (Belgian) cooking at the highest level, perfectionist food that isn't always easy to grasp. As a chef he's clearly is in complete control, both conceptually and when it comes to execution. His food comes across as relatively intellectual and sometimes somewhat reserved in nature. These are not come-hither dishes but plates of food that require careful consideration but sometimes leave the diner in awe and confused at the same time. At Hof van Cleve both the senses and the mind are guaranteed a full-throttle three-star experience and I sincerely hope to increase the frequency of my visits.